Alarm code typically specifies height at which alarm strobes will be mounted. 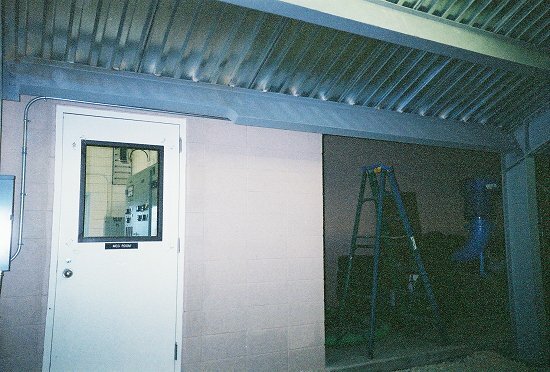 The door in the first picture is "identified" by a strobe carefully placed at the correct heigth....no matter that the strobe is completely out of sight at that location! Easy fix, grab a sawzall and cut a 4"x4" hole in the awning so the flash of the strobe will shine through! I would say someone was doing exactly what the prints shown, looking for some extras money when the final inspection revaled this little gem of engineering genius. A good example of trades not communicating. Well something's got to warn the rats and cockraches that live up there. Seriously....does the wall and the fire alarm strobe pre-date that second tin roof or were both of them put up at the same time? Looks to me like that was an outside-facing wall at one time. 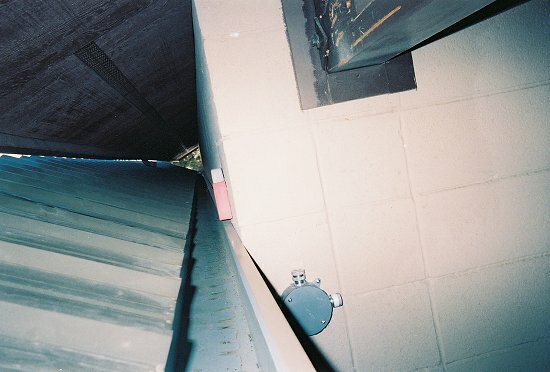 Given the precision-notched rain gutter/purlin, should the strobe be NEMA-3R rated? With the likelihood of late-season mosquitoes and maggots in stagnant gutter water, the place may develop problems beyond electrical enunciators. Sven, move to the head of thre class! The wall was an outside wall; last summer this space was covered (but not truly "enclosed"), and the new roof blocked view of the strobe. The "precision notched purlin" is, in fact, a modified I-beam. As for 'critters.' well, I arrived on day #2 of the job to find a squirrell eating the heart of my print! Don't you hate it when that happens?